Horrorpunk is a genre that has a very international appeal. Back when I was first getting into the genre I was blown away by how many bands came from all different corners of the world. I was recently contacted by a band based out of Mexico known as the Los R.I.Ppers. 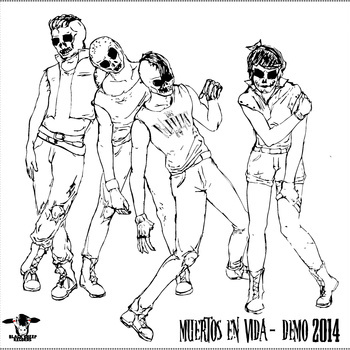 They have provided me with a copy of their new demo EP Muertos En Vida (Spanish for Dead In Life) to see my thoughts. Now, this is actually one of the very first times I have listened and done a review for an album that is mostly in a different language as well as English so I was intrigued to check it out and share my thoughts. After all, Horror is a universal language. The demo starts with Overture, which is your standard instrumental intro track. Not much else to share with regards to it. Horror Has Just Begun is the first track where you get a taste for what the band has to offer. The musicianship is very solid and keeps moving at the standard breakneck pace that most horrorpunk bands embrace and are comfortable with. What sets Los R.I.P.pers apart from many of their contemporaries are definitely the vocals. They have a very harsh tone while still managing a hint of melodicism that works well with the subject matter and the backing instrumentals. I can’t really compare it to any other band that I have encountered so this certainly helps the bands sound stand out from the rest of the herd. The Thing slows the pace down slightly without going soft, while being littered with samples from films throughout. Things take a turn when we get to the bands cover of Halloween by The Misfits. It isn’t your standard cover as the whole song is done in their native tongue. At first I wasn’t sure it would work but I couldn’t help but bob my head along. Knowing the original song helps as you actually have an idea of what the Spanish lyrics are which helps the enjoyment of the song. Rest In Pieces once again slows things down for its introduction, before picking up for what is the most melodic song on the album. I’d also say it may be the strongest track on the demo. The harsh vocals mend well with the melodic instrumentals for one catchy tune. Up next the band reverts to their native tongue for Lujuria En El Cementeri (Lust In The Cemetery). Unlike Halloween which was also in Spanish I don’t have a source material to refer so I can’t go into the details of the lyrics. But I can say that the song is catchy and I could see it being a fan favorite at concerts. At this point the official demo is wrapped up, but the band has included some live covers as well as a live rendition of Lujuria En El Cementerio. I won’t go into much detail on these tracks however. I can let you know that the band sounds like they have a solid live show although these tracks are marred by sub par recording quality. Not the worst I’ve heard but certainly far from ideal live conditions. Overall, I have to say I am very glad that the band reached out to me. Los R.I.P.pers are one of the first Spanish horrorpunk bands I’ve taken the time to dig into, and I can say I will keep an eye peeled for future releases. If these demo tracks are any indication, a full length LP with a little better production values would be an enjoyable romp. To check out more of the band, give them a Like on their Facebook page. You can also pick up a digital copy of Muertos En Vida at their Bandcamp page.